Have you ever questioned the emotional state of your pet? Perhaps you have thought your pet was happy or sad at one time or another. According to the money column in the New York Times Magazine, guinea pigs are predisposed to loneliness. 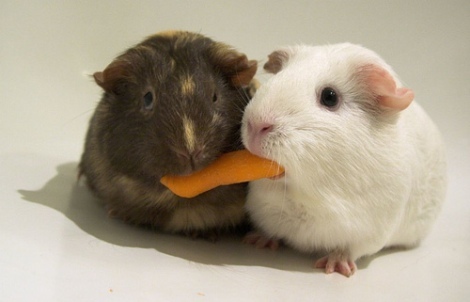 To solve this animal welfare issue, Switzerland passed a law making it illegal to own only one guinea pig. This might force a pet owner to buy a new guinea pig every time one passes away. Fortunately, guinea pigs are now available to rent in a town outside of Zurich for the small one time fee of $30. This is clearly an economic opportunity that was seized. This law illustrates a genuine concern for the overall wellbeing of animals. Switzerland’s guinea pig law shows that the legislature considered the mental health of the animals to be a legitimate concern thus requiring enactment of a law. There is a widespread interest for animal welfare in European countries. Several European countries including Switzerland, Norway and Germany have ratified a 1987 treaty, The European Convention for the Protection of Pet Animals. It establishes that animals have a moral value and therefore hold a status higher than mere property. This European Convention gives humans more responsibility than solely guardianship over their pets. Humans must ensure that their pets receive adequate exercise and take reasonable measures to prevent their escape. The Animal Welfare Act, the controlling animal welfare law in the United States, does not regulate animals on as high a level as in Europe. The standard of care in the United States is only “adequate” treatment, whereas the new guinea pig companion law indicates that adequate treatment is not sufficient. Adequate treatment includes providing food, water, veterinary care and protecting the animals from extreme heat or cold. The new guinea pig law in Switzerland goes beyond protecting these basic needs for survival and considers that animals, like humans, may have emotional needs requiring protection. Commercials aired in the United States advocating for better treatment of abused animals, and organizations such as PETA, demonstrate a general concern of many U.S. citizens for enhanced nurturing treatment of animals. Facilities such as doggy day cares suggest a public interest in socializing dogs, if not yet guinea pigs, to ward off loneliness and depression. This implies there may be more support for a law in the United States protecting the emotional wellbeing of animals than has been generally assumed. this needs to be coupled with a general anti breeding message. If you have to leave a pet for extended periods — say, to go to work — it is not kind to leave them all alone. Hence, I’ve hardly ever owned just one dog. They are just like young children and need to interact with other pets even if of a different species when their human family has to go out. Nonhuman animals have similar emotional needs as humans although in the US they are considered “things” for convenience and big business’ bottom line. I’ve found that when raised together, dogs and cats make great companions for one another, and keep each other good company — even though in the wild, canines and felines are vehement enemies. It is always a good idea to have a friend for your animal animal if possible. You can rescue two cats or dogs from the shelter instead of one and as long as you take great care of both animals equally, you will have a happy household.